The festival’s theme this year was “the American dream” and this naturally invited some political commentary at a festival where “message” art is typically rare. 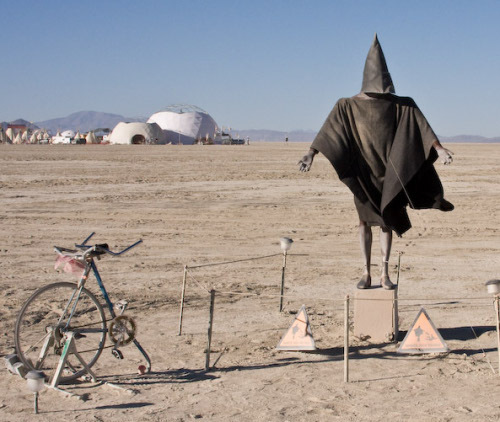 In “Mayhem”’s installation, passers-by could give electric shocks to a mannequin representing the iconic Abu Ghraib prisoner by pedaling a stationary bike nearby. It’s participatory! 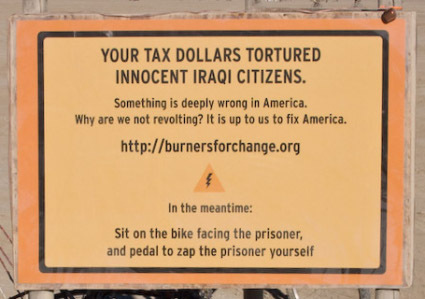 And just as participatory (a placard explained) is the real-life torture policy, thanks to the tax dollars that support it. But we are revolting! Oh.